Had a few different photos I was thinking about entering, putting this in b/c it's one I edited earlier & that way I know something is entered. Hope it's not a total flop. An interesting subject with bags of potential for an entire series of photographs! The border suits the photo well, drawing the eye in. I suspect this was taken in harsh light, as the shadows are quite short but very dark - it might be interesting to retake at different times of the day, if thta is a possibility. Compositionally, the sideways on truck acts as something of a barrier - it may have been preferrable to take the photo with the truck at more of an angle, which would allow for the viewers eye to be led into the photo more. an interesting place to shoot for sure, I think maybe a different angle would be more interesting, maybe a few steps closer and to the right so we could see the engine. 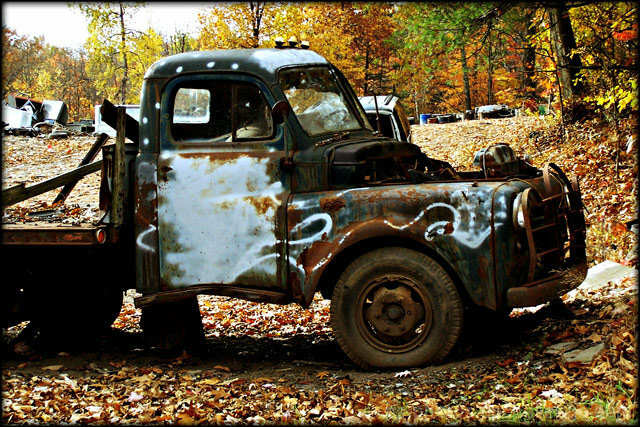 Heh, I love old trucks. Here, the perspective is rather ordinary. To evoke a feeling of abandonment and inferiority, stand on something and shoot downward. Or, you could have shot from more of an angle, showing the long and wide side at the same time. The vehicle in the background (the closest one) is rather ruining the line of the subject's cab. This is not a bad shot at all, but the ordinary perspective and weak composition don't fully do the subject justice. Proudly hosted by Sargasso Networks. Current Server Time: 04/21/2019 04:08:28 AM EDT.